(BEAVER FALLS, Pa.) - Geneva College is now granted membership in the National Council for State Authorization Reciprocity Agreements (SARA) initiative. This new state authorization makes Geneva’s online courses more accessible to students who reside outside of Pennsylvania. Prior to Geneva’s admittance to SARA, according to Correll, the college could serve students from a limited number of states. Effective immediately, Geneva’s online program for completing Bachelor’s degrees and Master’s degrees is authorized for residents in all SARA-compliant states, which does not include California, Florida and Massachusetts. In order for any college or university to issue a degree—whether traditional or online—that institution must receive government approval. Post-secondary institutions are only required to have accreditation from their home state. 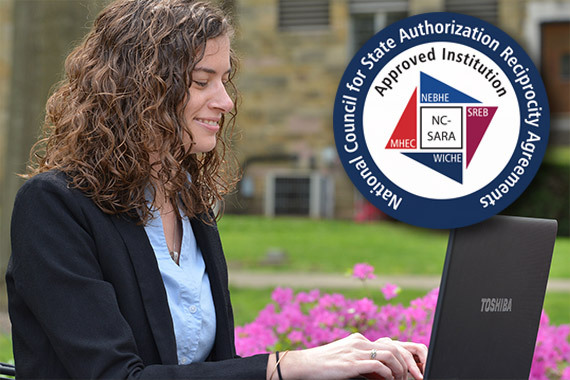 Once a college receives SARA accreditation, it is not necessary for them to get each states approval—if the state participates in SARA, they promise to respect a given educational institution’s credits. A unique aspect of SARA is that states and educational institutions join the initiative voluntarily. Participants willingly agree to abide by the regulations and standards set up in the SARA manual. Joining SARA shows transparency and a willingness to meet a standard of excellence. Geneva College offers online education granting bachelor’s degrees in Adult Degree Programs – geneva.edu/adult-degree – and master’s degrees in Graduate Programs – geneva.edu/graduate. Geneva College is a Christ-centered academic community that provides a comprehensive education to equip students for faithful and fruitful service to God and neighbor. Offering over 40 traditional undergraduate majors and programs, Adult Degree Programs with fully online and classroom options, and high-demand graduate degrees, Geneva's programs are recognized for their high quality. U.S. News & World Report ranks Geneva as a Top Three Best Value Regional University with one of the Top 100 engineering programs in the nation. Adhering to the truth of Scripture, a Geneva education is grounded in God’s Word as well as in a core curriculum designed to prepare students vocationally to think, write and communicate well in today’s world – geneva.edu.